Blowout Sale! Save 82% on the Ader Fitness Olympic Fractional Plates - 5 LB Set by Ader Sporting Goods at Strongman Pictures. MPN: OFP-5 LBS A. Hurry! Limited time offer. Offer valid only while supplies last. Micro-load with our Lb fractional plates. Improve your lifting progress with small weight increases to reach the next level and overcome plateaus. 0.25 LB Grey; 0.50 Lb Blue; 0.75 Lb Red; 1.0 Lb Black pair per size. Cutting by mill machine one at a time. The most accurate fractional plates on market, some are 0.1-1.0 % tolerance. 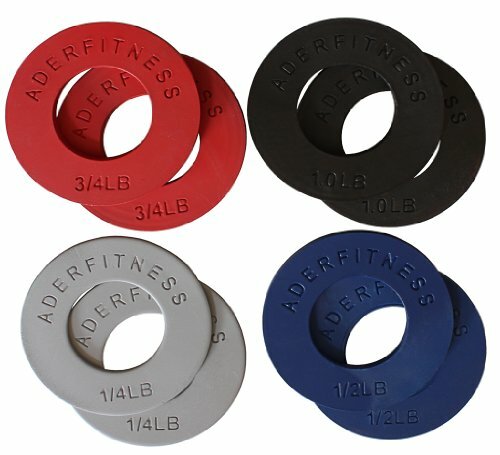 Powder-coated solid steel with clear engraved "Ader Fitness" logo & number of weights. Designed for a 2" dia. bar.